Got fruit flies, sticky gunk and foul smells emanating from the plastic tray that came with your store bought kegerator? Did you spill its nasty contents all over the floor just trying to get it to the sink to dump it because it's not self-draining. Get yourself a real drip tray that self drains just like at your favorite pub. The draft beer drip tray serves two related purposes: collecting overflow from glasses and post-pouring drips that fall from the faucet. For cleanliness and appearance you should have one. As I just mentioned most store bought kegerators come with a simple plastic tray with a grate. If you're serving a lot of beer, you'll have to dump that tray frequently. 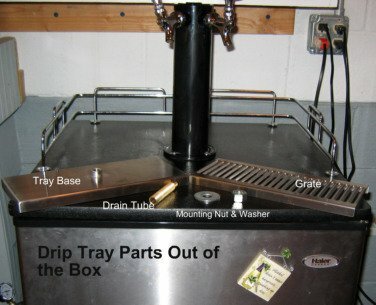 The solution is to install a professional quality drip/drain tray that will not only collect the spilled and dripped beer, but drains it to a location inside your kegerator for dumping later. This helps prevent smells, fruit flies and stickiness. Also, you won't end up spilling the contents of a full try all over the floor trying to dump the plastic tray. Plus you'll be upgrading the look and feel of your home bar. 1. A professional quality drip tray sized to suit your system. * These will usually come with the necessary mounting hardware. 2. Four or five feet of 3/8 inch vinyl tubing (in this case the hardware store variety is fine). 3. A female adapter sized to match the threaded drain tube on the drip tray (usually 1/2 inch) with a 3/8 in hose barb. 4. Two worm style hose clamps to match the outside diameter of the hose. 5. A collection bottle specially made for this purpose (or you can make one yourself with a 1 litre soda bottle). Drip trays come in a wide array of styles and sizes and in stainless steel or brass. Once you've measured the size for your drip tray as above, you'll need to decide on the style and color. If this is an installation on a kegerator top and not a customized bar top, you will probably want the rectangular, surface mount style. This style will require the least amount of modifications for your kegerator top. 1. Position the tray only (without the drain insert or drain tube) under your faucet(s) and center the tray as best a possible and with a pencil mark the outline of the center hole of the tray. Also mark the corners once you are sure the tray is straight or otherwise in the position you want it. 2. Place the end of the drain tube on the outline you drew and confirm the size is correct to allow the drain tube to slip through once the hole is drilled. 3. With the hole saw or drill bit start drilling your hole from the top down into the box. Allow the pilot bit to sink just enough for the saw's teeth to begin to engage the top. Stop and lift the saw away to confirm that you are drilling in the right place. If not, start again. You will be able to feel the resistance of the drill bit or saw cut through the fiber-board of the top then easily cut through a layer of insulation. Once the pilot bit penetrates the inside wall of the kegerator you will feel resistance again. Stop and lift the saw out of the hole. Remove the debris from the hole and the saw. 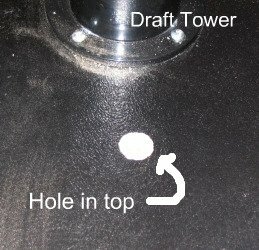 Now drill from the inside of the kegerator using the hole the pilot bit made from above. Drill through the interior wall and any remaining material above. This technique will help prevent splintering of the interior wall. 4. Clear any additional debris from the hole you’ve drilled then insert the drain tube through the bottom of the drip tray and then through the hole you drilled in the top. Position the tray according to your markers and screw the lock nut onto the drain tube. Tighten the lock nut up against the interior surface. Be careful not to screw too tightly as you may crack the interior lining as it compresses the insulation layer. Just tight enough to hold the tray in place at your chosen alignment is enough. 5. Connect one end of the vinyl hose to the hose barb on the female adapter. You can clamp this in place if you like. There will be no pressure on this connection so clamping may not be needed. Once the hose is connected, screw the adapter onto the threads of the drain tube. Since there will be no pressure on this connection, thread tape is optional. 6. Cut the hose to the length that you need to reach collection bottle in the location you have selected for it. In most installations the collection bottle loosely stands on the floor of the kegerator supported upright by the hose. Attach the hose to the barb on the collection bottle. Because the hose may support the bottle, you will want to clamp the connection here to prevent the connection from separating and the contents of the bottle from spilling out. To make a drain collection bottle, since most kegerators don’t come with them you can use a one liter plastic bottle or jar. You will have to modify the lid by drilling through the lid and screwing in a plastic male hose adapter. A ½ inch or smaller adapter is appropriate but judge from the size of the lid you are dealing with. Simply drill an appropriately sized hole in the center of the lid and screw the threaded end of the hose adapter into the hole. If it fits tightly work hard to get the threads engaged. This will seal the fitting. If the connection feels loose and wobbly, you may want to seal it with some thread tape of silicone sealant. Now to dump the waste simply unscrew the bottle or jar from its lid (leaving the hose attached). Carry the bottle or jar filled with waste to the nearest sink and dump it. Be sure to dump the waste frequently as it will collect quickly and things will get messy quickly if the waste backs up into the hose and you have unscrew the lid. It is possible in some installations to have the drip tray and hose drain directly into a sink or floor drain if one is available nearby. Consider this option for situations where it is possible.